If you’re reading The Boss, chapter ten has been posted! It’s here. If you’re following the read-a-long for The Boss, the post for chapters 9 and 10 are up! That’s here. And if you’re waiting patiently for a 50 Shades Darker recap, I’ll be working on that all day today and hopefully it will be out this evening. Because everyone knows all the hip kids are staying in and dicking around on the internet on a Saturday night. 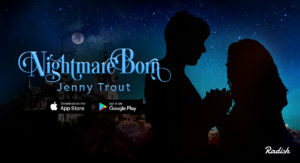 In my head, you end every night whispering into your husband's ear, “Trout out.” It's creepier than you're imagining.